Fully customizable reverb and room modeler. The DreamVerb Room Modeler plug-in for UAD-2 hardware and Apollo interfaces draws on the unparalleled flexibility of UA’s pioneering RealVerb Pro plug-in, and adds an intuitive and powerful interface to help you craft a stunning range of spaces. DreamVerb not only lets you create a room from a huge list of different materials and room shapes. It lets you customize further by blending or "morphing" the different room shapes and surfaces with one another, while the density of the air can be changed to simulate different ambient situations. 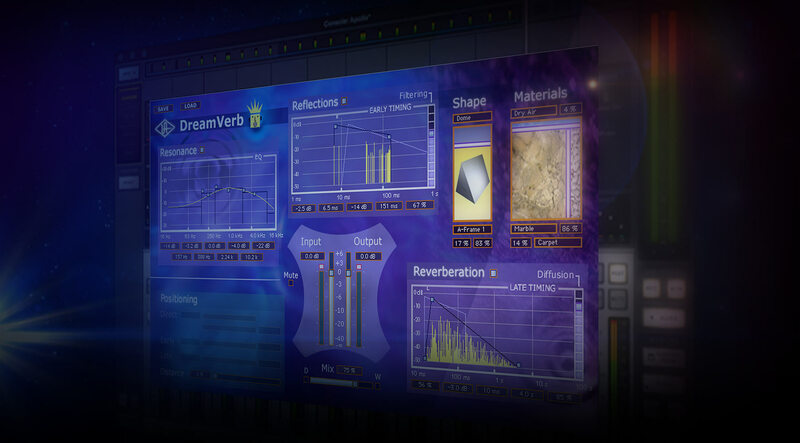 DreamVerb also features a flexible 5-band active EQ and unique level ramping for the early and late reflections for ultra-realistic dynamic room simulation. And with Universal Audio's proprietary smoothing algorithm, all parameters can be adjusted in real-time with no "zipper-noise' or audible artifacts. DreamVerb also features lots of graphic feedback for the user to understand just how their choices affect the reverb. From a vibrantly dynamic room to a rich, deep cathedral, DreamVerb is the reverb of your dreams. Dreamverb Plug-In mix it with synth sounds. The recently purchased Dreamverb Plug-In proved that reverberation should be diverse. I mix it with synth sounds, it distinguishable M/S EQ Brainworx. I think DreamVerb might be one of the more underestimated reverbs in the UAD family. It's very diverse and being able to basically create a custom space with different materials, shape, etc is really cool. I have (and love) both the EMT 140 and the EMT 250, both have a very distinct sound. But often times DreamVerb, with its incredible flexibility and warmth, ends up being the one I choose. Highly recommend! After using a Sony Dr 77, I thought i would never be able to replace, after using a whole load of other Soft Reverbs, I have finally got a pretty damned close replacement plus its a whole lot more convenient and I am not constrained to a single unit. after 1 1/2 years of building our new studio facilities, we'd decided to work with UAD. We have the Apollo and the UAD Quad with most of the Plug-Ins. Our Computer is a Mac 2 x 2,66 GHz Quad-Core with 32 GB 1066 MHz DDR3 RAM. We use 500 GB SD Disk for the System and for the instrument samples. We are just finishing our first - all self made - production. We have recorded, mixed and mastered all 13 songs using UAD tools. Dreamverb for guitar and solo instruments. We are very happy with the sound of the presets. Exactly what we were looking for!! Thanks. Reverb is by far the most complex of calculations in audio production, and only the highest quality of algorithms provide the smooth tail required for accurate room modelling. I run several reverb devices in my system at "ToKwerX" but the latest addition is the DreamVerb from UAD. I am currently mixing a jazz album featuring a real 9 foot grand piano, double bass, female vocal, drums, guitar and alto saxophone. The ability to create lush, rich reverbs without swallowing definition is by far the first noticeable difference with this processor. I happily use it alongside TL Space with real Impulse Responses from acoustic spaces and the comparative sound quality is wonderful. Note though the TL Space takes up several TDM chips to render the sounds I prefer. The DreamVerb lets me dig a lot deeper and without the processing appetite, fine tuning elements of not just decay but room shape and diffusive materials within that room. Add to this an ability to blend or "morph" these elements and I struggle to find a reverb processor that gives me such control whilst still sounding natural. Rich and clear, unobtrusive and above all - natural. DreamVerb is a wonderful addition to my choices of reverbs. P.S. Haven't actually used another processor since getting this one. A good exsample is a scene where I needed to place the narrator into a huge underground parking garage and about 20m away from the listener. I 'build' the space around him quickly and easily and was quite surprised to find that even with a pretty wet mix the intelligibility didn't suffer. Next, I added some traffic noises on another track, added another Dreamverb with the same preset, set distance even higher, some eqing and had transformed a pretty lengthy monologue into an exciting soundscape that really pulled you in. Dreamverb is way more dense and sound a lot better than the Realverb. I agree that it has some of the sound from the Realverb but much more dense! I almost didn´t buy it first when some persons wrote that it´s only a minor upgrade from Realverb, the sound is definately a MAJOR upgrade! In my opinion it´s in the same class as TC and Lexicon reverbs! Impressive results can be obtained with this baby, but overall, it's more an upgrade of the RealVerb Pro than a different reverb unit. It has the same color, the same parameters to play with and a different look. The differences are 5 band EQ instead of 3, 3 choices of material instead of two... The rest is the same. In terms of DSP usage, it's pretty much the same. So, sure, you can get more different results. But the Realverb Pro is close enough to prevent you from buying this one. I think the Dream Verb ist an excellent sounding reverb with a lot of posibillities to edit the parameters of the specified room. Especially I like the DIstance fader which makes it pretty easy to place the signal at the exact right spot in the room/on the stage you virtually created. The only disantvantage with this method is that you have to put a Dream Verb Instance on every Track the you wanna mix with a diffrent distance, a method wich cost a lot of DSP-Power. This reverb generator sounds very artificial and most of all "metallic". Like a bit crucher on the tail that makes "Criiinnnn…"
This was an hep full reverb 10 years ago but now it's completely unusable compare to new reverb plug ins. Need to be updated ! The dreamverb has a very natural sound. Great character. It is my now favorite reverb. It is simple to set up. The pre-sets sound great. And this is the 'must own' for me. Perfect sound, which I am %100 happy with. I can also recommend this to anyone for its ease of use & price! This review will be scathing, not because I don't like the plug-in. I like the plug-in enough to purchase it twice. Forced to purchase it twice, and lose a couple of thousand dollars I've invested in many other UAD plug-ins because of UAD's despotic product policies. My investment in plug-ins is largely associated with an unsupported UAD-1 card, which I cannot transfer to my Apollo Twin because I purchased the Twin after the drop-dead date on UAD's support of the older card. I was told prior to purchasing the Twin that all plug-ins would transfer automatically, but I was locked out of my UAD-1 account, presumably because EOS had passed, had to create a new account to register the new product. No resolution possible is the final response. It sounds bad. I really do not like it. And thats it. this is from the best plugins ive used.excellent plugin.period! Not review to low price and specific exterior, sounds much even fittingly, not worse some dearly. Much possibilities for reception of the miscellaneous volume Handle good.. I help in work. It 's Dangerous? ^^ Bye !